The BBC has confirmed plans to eliminate 2,500 jobs in a bid to save $4 billion over the next five years, The Times of London reported Thursday. Details are being given to staff at briefings across the country, with Director-General Mark Thompson explaining that he wanted to announce the layoffs quickly to avoid plunging the corporation into uncertainty. The BBC is to create some new jobs and to offer re-deployment to some of its staff so the net loss of jobs will be 1,800, The Times said. The number of programs made will also be decreased by 10 percent, saving about $200 million a year. The network's employees are said to be upset about having to reapply for their jobs. The National Union of Journalists and the broadcasting workers union Bectu have warned of industrial action over the job cuts. The unions were expected to meet Thursday to decide what to do next. Most of he jobs cut are in BBC News, news operations in Scotland, Wales, Northern Ireland and around England, and the division that makes factual and other television programs. 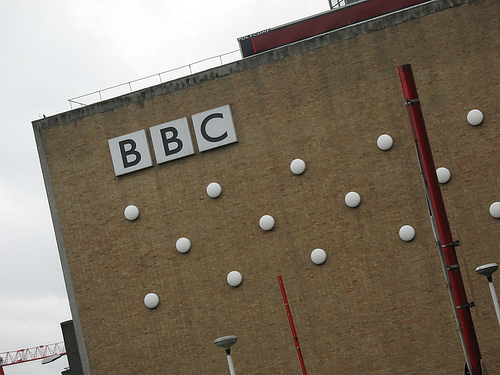 The BBC also intends to sell Television Centre in west London in 2013.